Gray felt hat with brown and white feathers. 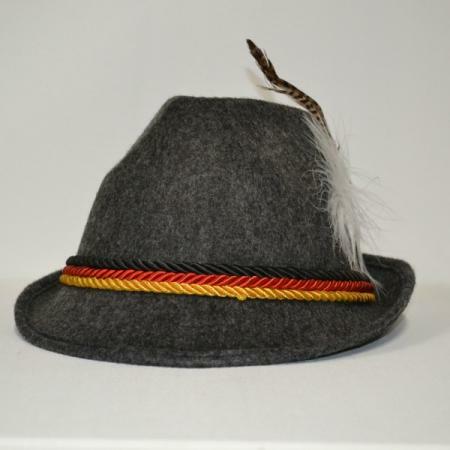 Features Germany flag colored bands around rim of hat. Hat measures approximately size 57 (7 1/8). Imported. Gold Eagle pin with “Tyrol” banner. Imported. Measures 1″ by 1″. Painted Kufstein flower hat pin featuring white, blue and red flowers with a “Kufstein” banner. Imported. Measures 1″ by 1 1/4″. German colors with “Deautschland” and eagle. Imported. Measures 7/8″ in diameter.